Sappho was arguably the greatest poet of the Classical period. Plato hailed her as the Tenth Muse. She instituted a poetry of human emotions and introspection when hitherto, Greek poetry had concentrated on the deeds of the gods and of mythic heroes. In so doing, she may be said to be the founder of modern Western poetry and the first Rajasic poet of the Kali Yuga. She was the head of a female academy, and wrote with great affection of the young girl-scholars who surrounded her, and particularly her intimate inner circle. Her house was known as a house of moisopoloi, or “servants of the Muses”. It is a fascinating thought that the individualistic, romantic, lyric verse, which in the West is what is most commonly understood by the term “poetry” was, in fact, originally female in orientation, born in an all-female setting and centred on the theme of divine affection between maid and maid. Very little of Sappho’s work now survives, largely owing to the arson attack made on the great library at Alexandria by members of a militant sect known as Christians. Many of the literary treasures of the ancient world were lost forever in the great fire that ensued, including most of the works of Sappho. Only three complete poems remained to the world, and even they had to be conjecturally reconstructed in parts. In the year twenty-oh-five, that number increased to four, owing to the discovery, in an ancient Egyptian tomb of the earliest manuscript of her work so far known. It was copied early in the third century B.C., a little over 300 years after she wrote. This manuscript contained three of her poems, all in fragmentary states, as is usually the case. However one of them had been known since 1922 from an Oxyrhynchus papyrus of the third century A.D., and by combining the two fragmentary texts, the complete poem could be reconstructed. The poem was written in Sappho’s old age. She watches her young scholars, her moisopoloi, dancing and singing, and recalls the days of her own youth and gracefulness. She laments her lot, and then speaks of the folly of lamenting, recalling the legend of Tithonus, who, beloved of Eos, goddess of the dawn, was carried off by her. The goddess asked Zeus for the boon of eternal life for her mortal spouse, which was granted; but she forgot to ask for eternal youth, and so Tithonus grew older and older without ever dying, until finally he was confined to his room, chattering endlessly but unable to move. The parallel with Sappho, whose young protégées, to whom she has devoted her life and given her deepest affections, are eternally young, because new girls continually arrive at her academy, while time relentlessly drains her strength and beauty, is deeply poignant. The original poem is in six couplets and is very economically written. Classical Greek grammar, being older and purer than that of our modern languages, is more tightly structured and complex. Consequently, like other ancient languages, it is capable of expressing more in fewer words. It also makes references that have little or no immediate emotional resonance with a modern reader unless they are expanded. For this reason we have elaborated the verse slightly, adopting the romantic, rather than the terse, “modernist”, style. We have, however, interpolated very little and have stayed very close to the text. Our aim has been to present the poem in a translation that will have the same emotional effect upon a modern hearer as the original poem would have had upon its earliest audiences. We have used the familiar iambic pentameter to represent Sappho’s meter. And the sweet music of the pure-toned lyre. Seized by old age; my raven-hair is whitened. Will scarcely bear me as I walk a pace. That all my youthful joy should end in this. But wherefore murmur? I am but a maid. Can one avoid the fate of all our kind? That goddess being overcome with love. The mortal husband of immortal wife. The Empress is Her Imperial Majesty Celestia III. She is the direct descendant of Sai Rayanna, the Sun-Daughter and first Cairen Empress. She is regarded, in her function if not in her person, as the incarnation of the sun herself. This is the meaning of the great salutation: Rayati Raihiranya – Hail to the Empress (as an incarnation of the Sun). The position of Empress is therefore a hereditary one although it does not necessarily follow the Tellurian law of primogeniture. All daughters of the Imperial Family are Imperial Princesses and all are brought up in seclusion and with considerable rigour in the great temple-palace at the heart of the Imperial City. The slightly modern way of life adopted by some Westrenne Royal Families is out of the question for the Imperial Family. An Imperial Princess is one of the most highly-trained, profoundly cultured and rigorously disciplined maidens in the Empire. The selection of the Imperial Princess who is to become Empress takes place according to tests and rituals that are unknown to any outside the highest Haiela and Raihira who make up the Traditional hierarchy of the Imperial Court and Sun-Temple. The still point from which all movement arises, like the point without extension from which all space proceeds, is represented on earth by Her Serene Majesty; and her governance of the Empire is likened to the actionless action of the Spirit. It is from this central idea that the term “Serene Highness” is accorded secondarily to the whole Imperial Family. However, in the Westrenne lands there is a certain spirit of “activism”, “individualism” and “exteriorism” akin to, but by no means as extreme as, that in modern Western Telluria, and this spirit, at its most gross, can see serenity as simple inactivity. The pretence that the “Serene” in “Serene Highness” denotes lack of authority or active participation in Government is thus a humorously deliberate “misunderstanding”. Actually the reason they are often known by this title is that it is one of the fundamental titles belonging to the Imperial Family and held by all its members, as opposed to some other titles which derive from particular functions. Incidentally, the term “All serene”, used in Aristasian military and other circles, means “all in order”: and while its superficial meaning is “all quiet, nothing wrong”, at a profounder level it implies “all is right” – i.e. all is in harmony with the serenely unchanging Principle, and thus with the Will of Heaven – and by extension of Heaven’s daughter, the Empress. I am relatively new to Aristasia (and I am not so good at English, but I hope you will be patient with me!!!). I have a question about how a maid can re-racinate and re-educate herself ; especially while being, like I am, ‘on her own’ and not having the possibility to attend Aristasia-in-Telluria events, nor events in Virtualia (due to the capacity limits of my ordinator), apart from The White Rose Room. Which books, or films, would you suggest to read or watch, that are particularly charming and where one can be inspired by how maids are clothed, how they behave, talk, or which are the books where one can feel this lost atmosphere of innocence, grace and charm, or even learn about etiquette and proper behaviour? Which up-to-date magazines would you recommend? I am also interested in books that analyze deeper and more subtle subjects, such as Archetypes and their importance. Would that be useful also to read old books in my own language, that are written in a proper language? On the subject of clothes, I have tried to find nice and feminine up-to-date clothes or accessories on this Elektraspace market, but it’s not so evident for me to know how to wear them without a reference or a guide. I am sure books and films from your own country will be helpful to you. It is often said that it is not necessarily the most “artistic” books and films that are the most racinating, but those that give a straightforward picture of the Real World. The books of Agatha Christie are often recommended, as are schoolgirl books from the ’20s to the ’50s. Schoolgirl books are something of a British institution. Stories of life in girls’ schools – usually boarding schools – flourished from the 1920s to the 1950s. They depict an all-female world, usually with values of honour, loyalty, and nobility; thus they make rather excellent Aristasian reading. Many authoresses specialise in them. Angela Brazil, Ethel Talbot, and Elinor Brent-Dyer are important names. The hugely prolific Enid Blyton also wrote numerous books in this genre. There are lots of others and I am sure I have missed out many people’s favourites. In Britain, among films, run-of-the-mill comedies and thrillers are often excellent racinating fare, with lovely street-scenes, sophisticated night-club scenes and in general a charming view of real British life. The ladies tend to dress and speak in ways that we can all profitably emulate. Run-of-the-mill comedies just means ordinary, everyday ones “B features”, I think our American friends call them. Nothing spectacular; just straightforward depictions of Quirinelle or Kadoria. Their very “ordinariness” can actually be an advantage in that one is not seeing a “clever slant” on the real world, but just seeing it as it is, through its own eyes, as it were. Now, how about your wardrobe? Well, probably the best thing to do is to start with black and start to build colours around it. First, choose a particular style – perhaps Trentish Chic or Quirrie Crispness or the more stark Kadorian lines. Once the choice has been made, find a black skirt that fits in with it. Quirrie girls usually go for a full circle skirt that comes to somewhere just below the knee. A Trentish lady will want something quite fitted around the hips but perhaps with inverted pleats or a wider bias-cut hemline. Next, find something for the top half. There is nothing quite as versatile or safe as a basic twin set – and it fits in with any period. For Trent, choose Pastel shades, for Kadoria something like dusty pink or baby blue. For Quirinelle you ought probably to choose bright red or electric blue. The important thing about wearing a twinset is the (hm-hm!) brassiere! Trentish and Kadorian styles ought to have something of the order of a basic “cross your heart”, Playtex type of bra. For authentic Quirrie lines, think about a push-up, wonderbra or (best of all) a Marilynesque conical bra. Trim your new outfits with belts, brooches, pearls and anything else you can find. However, two absolute essentials must be considered besides. First, no Quirrie, Trentish or Kadorian lady will ever leave the house without gloves and only very rarely without a hat. Gloves are not worn in the Pit because one’s hands are cold, but because Bongos don’t wear them. They are the absolute last word in class and style and you ought to have lots of them. Secondly, tights are hideous! Get yourself a good suspender belt immediately and start wearing stockings. If you want advice about stockings, do ask; I shall be delighted to discuss them on a different occasion. You may be able to obtain properly-styled clothing second-hand. However, if you can use a sewing machine, why not make your own? Quirrie skirts are one of the easiest things in the world to make! Good luck! Do send photographs when you have affected your transformation – brunettes always like to see pictures of well-dressed blondes! Please pardon my intrusion upon your discussion, but Hautefontaine becomes so lonely when my Maman is away… I thought it would not be unfitting if I sought diversion here. . Our country is called France, but it is not the France you know: it is another France, far distant, bordering Amazonia, and our customs are said to be very strange — I have heard it whispered that Westerners would consider us immoral. I don’t know why… everything here seems perfectly in tune with the Golden Order to me. I know that France is the best and most delightful of all places in the world, and Hautefontaine is the dearest of all chateaux, and I am a lucky maid indeed to be situated as I am. I should not like you to think that I am anything but the most proper of blondes, so I shall be on my very best behaviour here, as if I were invited into the secret cabinets of our dear blonde Queen, Marie-Antoinette! It is not such a stretch to imagine that, for I was presented at Versailles when I was not quite fourteen, and fresh from a year at school in the West. I have sat amongst Her Majesty’s ladies several times, as we nibbled Turkish Delight and told each other’s fortunes, and spied on the new court artists from behind our fans! The last time, Marie-France slipped in and snatched my fan, and refused to give it back until I promised to ride with the Royal Hunt the very next morning! She really is the most incorrigible of brunettes, but a lot may be forgiven a Dauphine!Oh! I have not introduced myself, have I? Very well: I am, by the grace of Dea, Marie-Marguerite Celeste Emma de Saint-Vire, Marquise de Gothia. My Maman is Nathalie Ghislaine Electra de Saint-Vire, Marquise de Saint-Vire, Comtesse de Roquejardin, Comtesse de Gothia, and Generelle de Saint-Vire. Yes, ‘Generelle’, for in addition to the titles settled upon her, she is a great military commandress, and wears the most lovely blue and gold uniforms. She’s my brunette Maman; my own darling blonde Maman passed on some years ago… she was an Englishwoman; Lady Emma Hamilton, and it is after her, in part, that I am named. Marie-Marguerite is for my grandmere, the Duchesse de Gothia, head of our family even though she has passed many of her duties and titles to my Maman. But in deference to those two ladies, I am called by the least distinguished of my names: Celeste. You may address me as Mademoiselle de Saint-Vire, or de Gothia, or Mademoiselle la Marquise, as we say. Perhaps when we know each other a little better, we may use first names. Haven’t I a very large name? I’m sad to say it goes with being a very large blonde… don’t mistake: my waist is as neat as Her Majesty’s, but I am as tall as a beanpole, and even my Maman can barely look over my head! I’m seventeen years old now, and I still seem to be shooting upwards, as if, Marie-France says, my hair is trying to reunite with the sun that once kissed it. At least, that is almost what she said… I am not as adept at translating from French to Westrenne as my Maman is, bas bleu though I am. My language may sometimes seem clumsy to you. I hope you won’t mind. I should like very much to be liked here, for the company of my ladies, while always soothing, isn’t always scintillating. They do not read as I do — I don’t imagine many brunettes do either, for, you see, I was reared by a Generelle who is also a scholar, and my earliest memories are of her reading aloud to my blonde Maman and me. Books are just as beautiful to me as satin slippers, and given my choice, I should go without slippers to have a new book to dizzy myself with. While my tutors never forgot my blondeness, they educated me almost as they would a brunette — in deportment and music and drawing, to be sure, but also in history and literature and geography and languages. I speak, read, and write, French, Westrenne, Italienne, and Latin, and I have a little German… and when I travelled in the East with my Maman, for her studies, I learned a few words of the strange tongues spoken there. I forget things, of course… my Maman says that even the most intelligent blondes tend to lack mental organisation, and she says it in such a loving way that my cheeks flush and my irregular verbs fly right out of my head. But she is patient with me, and coaxes them back between my ears, however long it takes. Do you think such learning unfits me for marriage? I overheard Madame la Comtesse de Pougy say as much to my Maman… but who minds La Pougy, I wonder? Not our circle, to be sure! La, I speak as though I were already a saloniste! I must go now… I have babbled on too long as it is, and I hear Sidonie looking for me, to dress me for the evening. I shall wear my new powder-blue velvet, with cabochon diamonds about my throat, and I think I should like my hair dressed a la Melisande. Pouf! I’m glad powdered hair is no longer in vogue; it made me sneeze horribly! 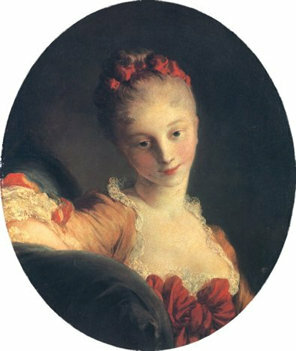 But you can see, here, in this portrait by Madame Fragonard, that it did become me! Following on from the previous post on the symbolism of temples, here are two more examples of the tiered temple, the first from India, the second from Mexico. Tellurian scholars usually consider such cultural similarity at widely diverse places as evidence of an ancient connection between the two areas – but rather it is evidence of the universality of true traditional symbolism! The Temple shares the symbolism of the mountain as Centre and axis of the world. Many ancient temple forms represent the mountain with its stages of ascent — Babylonian and Sumerian ziggurats, the tiered, pyramidial Indian temple and the multiple-roofed pagoda are examples. All these forms go back to matriarchal times. This is an image of the cosmos, ascending through higher and higher levels of reality to the pure and absolute Reality. Often there would be seven levels, ruled by the seven planetary principles or the seven colours of the spectrum, and therefore by the seven great Janyati. The ritual founding of a Temple re-enacts the Sacrifice of the Daughter, for the spiritual fruits of the Temple, like the the apples of the Tree of Life, have their roots in this Act. An image of the hanged Inanna was sometimes built into the altar itself. In patriarchal times, this degenerated into an actual blood-sacrifice — either human or animal — at the founding of a temple. This symbolism is also important when the Temple or Mountain is seen as a microcosm of the universe, for it is the Daughter’s sacrifice which makes possible the existence of the world in separation from the Absolute; and also opens the Way by which we may transcend it. I tend to melt when I attend the cinema. And no, not just because of the swooningly dashing brunette actresses. Some films are just so wholesome and innocent and a relief to my soul that I can’t help but get a little teary-eyed. I recently saw Cheaper By The Dozen and burst into tears. National Velvet, Gone With The Wind, Little Women…I love the silver screen! There’s a certain enchantment about it, isn’t there? Almost as though we are closer to the Idea as opposed to the mere Form. Oh yes, Miss Mayhew is so right! Real films can be such a relief to the soul – I do think that is one of the reasons we blondes – or some of us – seem to get so almost-unaccountably emotional. It is the sense of goodness and rightness and real femininity that one gets from real films. Once – this will sound so silly – I cried because an actress in a Trentish film was wearing such a beautiful art-neo jacket. But it is more than that, isn’t it – it is all the style and purity and glamour that such a jacket represents. Perhaps that is why some of us cry – especially if we live in Telluria – because we see the ideal that we so much long for and so seldom see in our everyday life. Yet I am sure that is not the only reason. Oh – one more thought – I was going back into the Archive and looking at the blonde from Sakura. I was rather impressed with the way her very-blonde hair fell over one eye. Only I hoped it was entirely sound and not a bit well, silly in the wrong way, if you know what I mean. I do hope not as I did rather adore it. You know I am sure I have seen the most adorable bob in a Vintesse film, cut in a positively geometric art-neo swathe over one eye – though I can’t remember whom it belonged to or which film it was in. Certainly my friend Miss Falconer at some time cultivated a wonderful jet-black bob covering her left eye most of the time. Of course one can always capture charming things, but one feels much safer with a precedent, does one not? And if any one should worry about over-the-eye styles, as fate would have it, our delightful Miss Mayhew has recently supplied us with a locus classicus with which nomaid could argue – assuming she had any breath to argue with! – Miss Veronica Lake. Here is a passage from a traditional Aristasian epic poem, dating from the days of the Cairen Empire. It is, of course, a Westrenne translation (note that “deer” doesn’t mean “deer” in the usual sense, but any animal, as with the German Tier). For they may hold a truth far more dreadful and dark than you deem. Scurried forth like to creatures that feared we should do them some hurt. Did call them unto her and hurry them swift from our sight. As our sweet lesser sisters of earth did eschew our approach. For the problem itself forbade asking of those that might tell. We came to a place where a beast stood athwart of our path. And wroth did she seem as she raisèd that voice to the sky. Never before hath the greatest deer off’red me hurt. My mount took a fear, and I own, as a blonde, thus did I. And Marenkhe, our dark-hair’d companion, did ride to the fore. A note from your Editrix: To appreciate the scansion of this traditional Aristasian blank verse, you must understand that each line carries five stresses: so, in the first line quoted here, the first stress falls on the first syllable: “DARKen the SUN”, but in the second line it falls on the third syllable: “For they MAY hold a TRUTH”. Be aware of this stress-pattern and you will quickly pick up the music of the verse. Note also the alternation of blonde and brunette line-endings (in a blonde line-ending the final stress falls on the penultimate syllable, in a brunette line ending it falls on the last syllable). Comments Off on Epic Poem: Darken the Sun? Although still languishing in the outermost of the circles, I aspire to truly Aristasian blondeness. I would be overjoyed if my beloved “brunette” Josephine had similar ambitions but she believes there is no place for her in Aristasia. She hails from Tellurian Nigeria and is about as brunette as one could be, in appearance. Can anyone help me persuade her otherwise? Dear Miss Batten – I do not know on what grounds your brunette feels there is no place for her in Aristasia. If she fears that she would not be welcome, please allow me to lay that fear to rest. There are girls from all over Telluria involved in Aristasia at various levels – from Kenya, Jamaica, China, India and lots of other places. You mention being on the outermost circle of Aristasia, and it is true, as you have clearly understood, that Aristasians do think in circles (no blonde jokes here, please) from the outermost circle, where one simply has a general attachment to Aristasia, probably among many other attachments in the Pit, to the innermost where one regards Aristasia as one’s true Nation and Culture and no longer sees oneself as a Tellurian at all. Whatever level one is at, the question is the same regardless of where one comes from in Telluria – how far does one identify with Aristasia? So please tell your brunette that girls are welcome in Aristasia wherever they come from, whatever their colour or culture. And they are welcome at any level – so if a girl is thinking that she wants to retain lots of her Tellurian culture, that is fine, an outerish circle is where she wants to be. If she wants to become fully Aristasian but wonders how her cultural background will fit in, remember that Aristasia has assimilated girls from just about everywhere. The process of becoming fully Aristasian is different for each individual, but race and culture are not barriers. I used to live next door to a Nigerian girl named Fatima who was so beautiful that I could barely keep from sighing when I met her in the lift or the laundry-room. She and her brother had been sent overseas for their education (their father was rather an important emir; I looked him up once), and she was one of the few truly polite and graceful people I met there. I say, the more Nigerians the better!